By Keith Giffen, J.M. DeMatteis, and Dale Eaglesham, et al. I know the team of Keith Giffen and J.M. DeMatteis have left some memorable marks on comicdom- perhaps the best remembered being their game-changing Justice League International - but there is something inherently more impressive about granting staying power to a post-apocalyptic Scooby-Doo comic. I don't know about everyone else, but one of the main differences between my comic book buying experience these days with those from back in the day, is that with all the C and D and freaking Q list properties getting thrown against the wall and with all the reboots and everything else, I am never quite sure whether or not a new series is supposed to be an ongoing or a mini. Scooby Apocalypse is a prime example. I mean, you hear about a post-apocalyptic Scooby-Doo comic and you kind of have that Archie vs. Predator response, right? Like ha ha, yes that is funny and will make a great conversation speed bump, and maybe you'll check out an issue to see if they skin Jughead, but they can't make a whole series out of that, can they? And here we are, eleven issues in, and I can't speak for the rest of the mom's-basement-loving world, but I'm invested for the long haul. Suffering guilt over her part in the nanite infestation that caused the apocalypse, Velma abandons the rest of the Scooby gang. Shaggy and Scooby track her across the emptied landscape while Fred and Daphne go through the laptop Velma left behind, detailing her involvement with doomsday, and argue about whether or not their bespectacled comrade even deserves their help. I'm hoping Dale Eaglesham's work in this issue was only meant as a fill-in and that series regular Howard Porter returns soon. Eaglesham's work is great, but is better suited to a more action oriented comic. 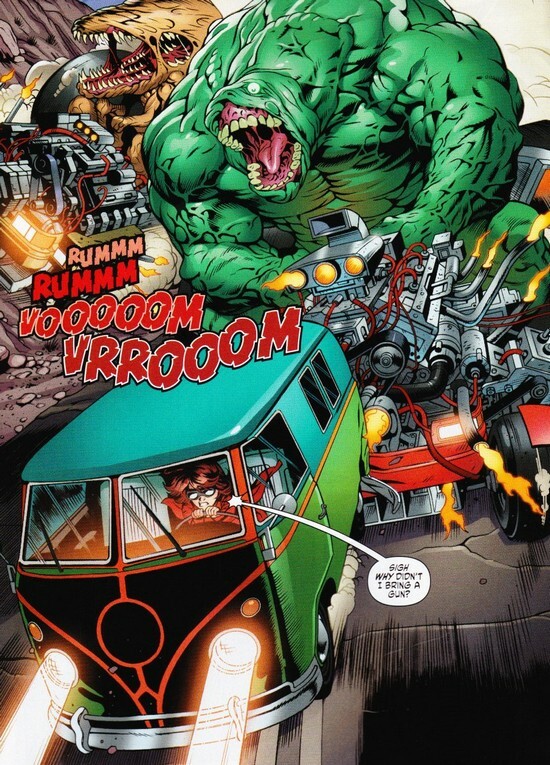 Sure, there's plenty of action in this issue of Scooby Apocalypse (including a battle with a pair of what are quite literally Monster Trucks, and in all fairness Eaglesham's renderings of them are fantastic), but Porter's more cartoony style lends itself better to the inherent humor of the story. Scooby Apocalypse #11 brings us another back-up story showing us a different view of the monster-ravaged world, and in particular we finally meet one of the Infamous "Four," (and am I the only one who keeps reading "The Four" referred to as villains in this series and keeps thinking of Planetary?). Though once I saw there was a back-up, I hoped to get more of the Scrappy-Doo story (hey, guess how many sentences I wrote today I never thought I'd write), meeting Rufus Dinkley was pretty great, too. "The View from the Tower" ends on a particularly violent note, and it's a perfect example of how well the storytellers are balancing the different pieces of this series. 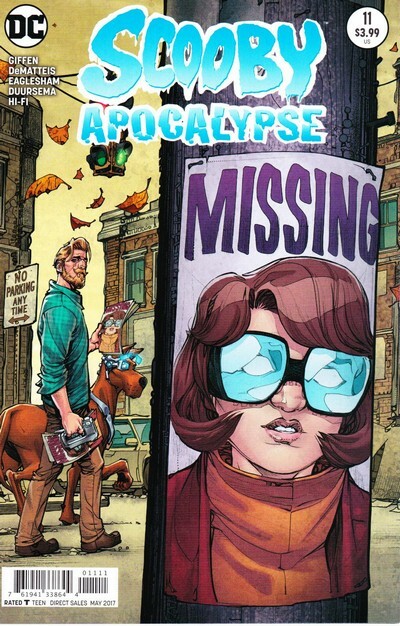 The competing dark and childish cartoon elements of Scooby Apocalypse could be very easy to unbalance, to tip over in either direction, but the storytellers are doing a great job. Each issue costs $3.99, meaning to date I have spent over $40 on Scooby-Doo comics. Never thought that would be a thing. Kind of nice to be surprised.